To see the Merkers Mine on Google Earth, please click here. 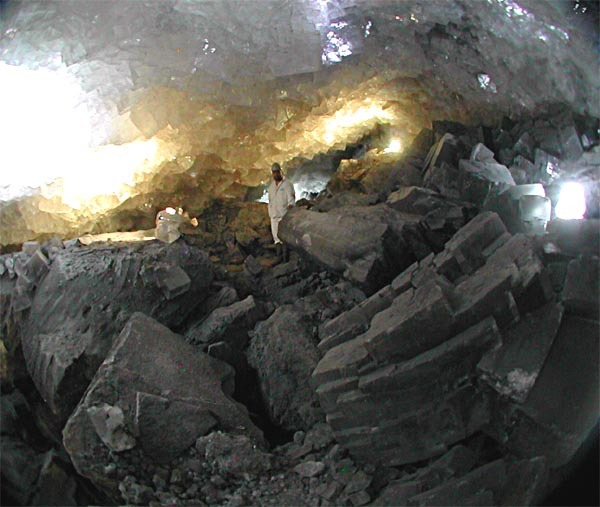 Giant crystals tend to occur in remote areas, which are difficult to visit even these days. Others places are strictly protected with only very limited access to scientists and privileged people. 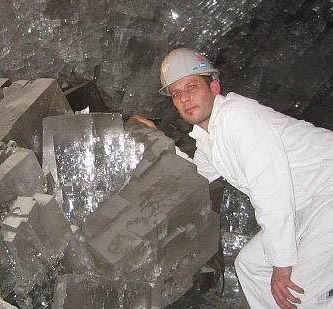 Or once famous giant crystal places are simply mined out since long time. The Merkers potash mine is different and can be easily visited by everybody. If you feel in the right mood to experience an outstanding underground mine, you can go down the Merkers shaft. 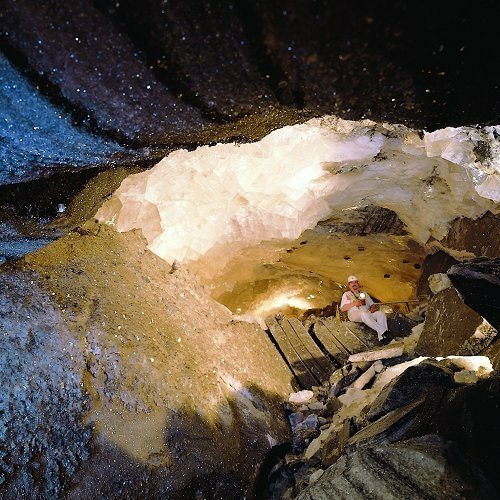 Apart from the thrill of experiencing a preserved potash mine with its fascinating machinery and the reconstructed "gold vault" of the Third Reich you are allowed to have a good look into the largest known salt crystal cave in Middle Europe. Halite salt rock is generally a very ductile type of rock, that is, under pressure it tends to flow slowly, until the salt will fill any voids available. An left behind open stope in a salt mine will normally shrink to a mere small hole in just a hundred years ! So the miners in the 750 meter deep Merkers mine were really surprised when they discovered a large natural cave at that depth. 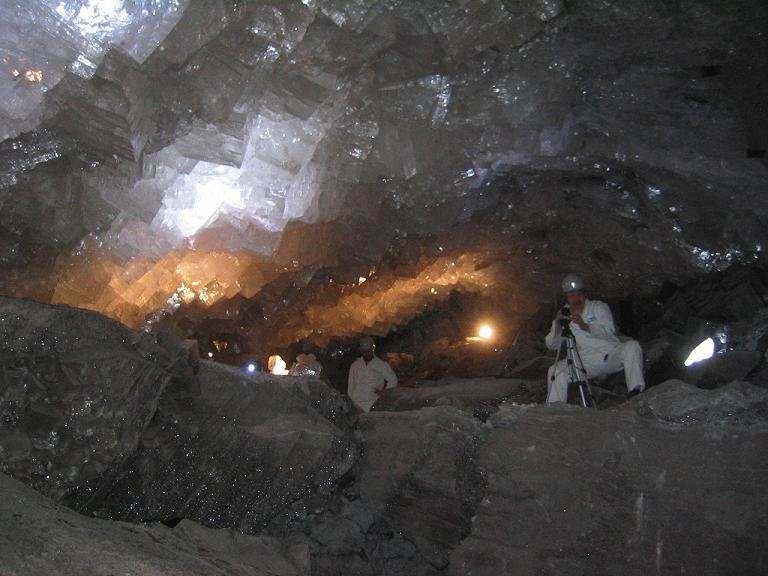 More - the cave was partly filled with giant halite cubes up to more than 1 meter size ! Knowing, that the government of socialistic Eastern Germany always was keen to sell outstanding mineral specimen in exchange for hard Deutschmark to the West, the miners deciced to seal off the opening to the cave and wait for better times. After the collapse of the GDR in 1990 the cave was opened up again and, while potash production in the mine was curtailed and finally stopped, it was decided to turn the whole mine into a mining museum. So here we are : One of the very few giant crystal localities which is a dedicated tourist attraction : the Erlebnisbergwerk Merkers. The formation of this extraordinary halite cubes is - notwithstanding their size - quite simple. Whereever there is free space in a salt mine, the ubiquitous migrating salt brines tends to crystallize on the walls of this space. Mostly these crystals are only small due to the small space available. In this case however the available space was large and so the crystals could grow to giant dimensions, not even filling up the whole cave. 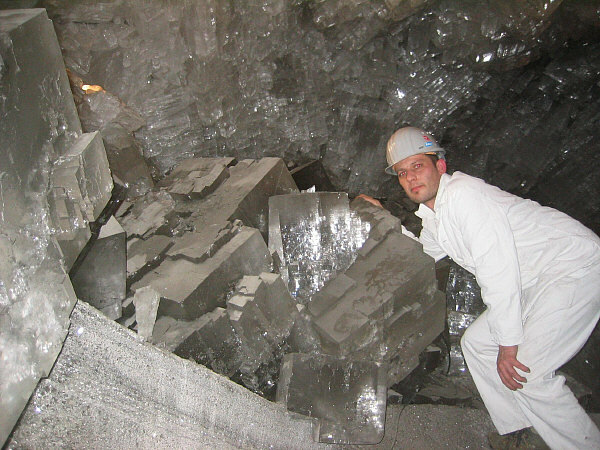 Crystallisation from saturated salt brines in anhydrite cave, which has been formed tectonically in brittle anhydrite formation. 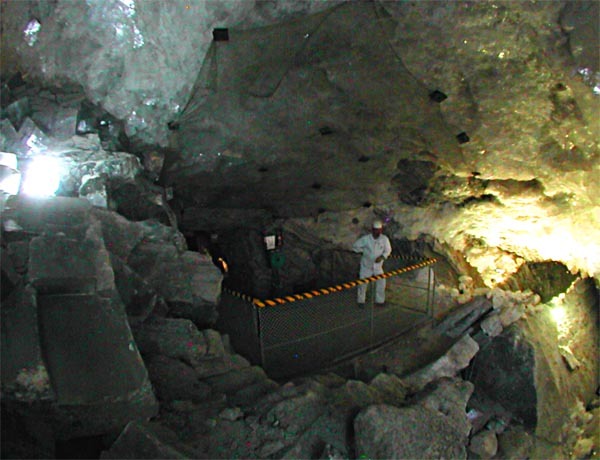 Museum mine, tourists are welcome to visit the crystal cave. A rare opportunity for a family friendly visit of a potash mine and giant crystals 750 meter underground. 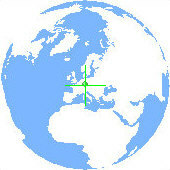 For more information on the mineral halite / rocksalt please have a look at www.mindat.org, Webmineral and the german Mineralienatlas. Information about the Merkers mine museum, its fascinating history, opening times etc. you can find on their website. Have you been at the site ? Do you have any comments or want to discuss the topic with us ? Click here to contact us !